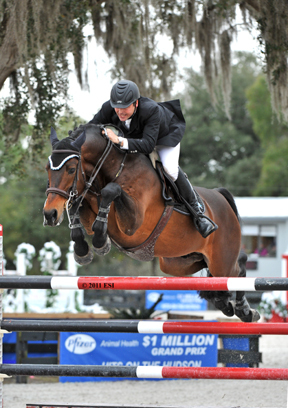 Silvio Mazzoni and Remonta Habano in the $25,000 SmartPak Grand Prix, presented by Pfizer Animal Health. OCALA, FL (February 11, 2011)--After a successful two-week Pre-Circuit and a short break, show jumping resumed at HITS Post Time Farm in Ocala, Florida on Tuesday with the Ocala Winter Classic, the first of six AA-rated weeks of competition. Silvio Mazzoni of Leesburg, Virginia piloted his own Remonta Habano to a decisive win in Thursday afternoon’s $25,000 SmartPak Grand Prix, presented by Pfizer Animal Health. 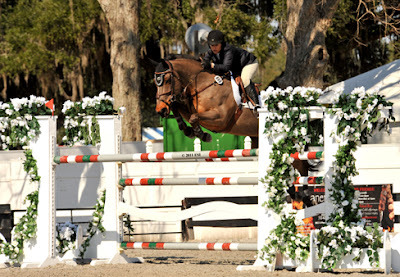 Mazzoni and Remonta Habano have been competing together for a year, and are one of several new horse-and-rider teams showing at HITS Ocala this season. Last year, the duo enjoyed six weeks at HITS Culpeper and finished the circuit with a win in the $15,000 Brook Ledge Open Jumper Prix at the Culpeper Finals. On Thursday at HITS Ocala, 30 riders took the field to navigate the first-round course set by International Course Designer Bernardo Cabral of Lisbon, Portugal. The course featured 12 obstacles and 15 efforts. The last line was a liverpool to a triple combination to a wide oxer to finish the course, and proved to be the toughest part of the course as 15 of the 30 teams had faults in that line. Three trips in, Hunter Holloway of Topeka, Kansas riding Hays Investment Corp.’s Argentina looked to be the first to go clear, but crossed the timers just a hair over the time allowed of 80 seconds. Holloway was one of three teams to rack up a single time fault in the class and, as a result, she finished in eighth place. Mazzoni followed Holloway and produced the first clear effort of the class within the time allowed. Three trips later, David Tromp of North Salem, New York and Beyaert Farm Inc.’s Casey laid down the next clear ride, ensuring a jump-off. Six trips later, Germany’s Andre Thieme joined the jump off list with Seth Vallhonrat’s Coco 135. Four trips later Tromp returned to the ring on his second mount, Renoir du Buisson, and went clean, which gave him a two-horse advantage in the jump-off. Three trips in, Hunter Holloway of Topeka, Kansas riding Hays Investment Corp.’s Argentina looked to be the first to go clear, but crossed the timers just a hair over the time allowed of 80 seconds. Holloway was one of three teams to rack up a single time fault in the class and, as a result, she finished in eighth place.Mazzoni followed Holloway and produced the first clear effort of the class within the time allowed. Three trips later, David Tromp of North Salem, New York and Beyaert Farm Inc.’s Casey laid down the next clear ride, ensuring a jump-off. Six trips later, Germany’s Andre Thieme joined the jump off list with Seth Vallhonrat’s Coco 135. Four trips later Tromp returned to the ring on his second mount, Renoir du Buisson, and went clean, which gave him a two-horse advantage in the jump-off. Jordan Coyne of New Port Richey, Florida and her own Lazaro were the last to go in the first round, and were the final pair to advance, setting the stage for an exciting jump-off. Cabral adjusted the first-round course for the jump-off and kept seven of the original obstacles, including the B and C elements of the triple combination, and the final oxer. Mazzoni and Remonta Habano, in their first Grand Prix outing of the season, set a strong pace for the rest of the field with a clear round in 37.414 seconds, the Great American Time to Beat, which earned them the win in their first Grand Prix outing of the season. Tromp and Casey took the field next and had a heartbreaking rail down at the last fence for a total of four faults in 38.690 seconds, which ultimately placed them third. Thieme and Coco 135 finished in second place with the only other double-clear effort of the day in 39.807 seconds. Coyne and Lazaro moved up to show fourth and dropped two rails mid-way through the track to end up with eight faults in 40.655 seconds and a fourth-place finish. As the last to go, Tromp and Renoir du Buisson looked to take the lead. The team pulled the same two rails as Coyne for eight jumping faults, and their time of 41.194 seconds was just a half-a-second behind, putting them in fifth place to end the class. Wednesday’s $2,500 Brook Ledge Open Welcome had 25 horse-and-rider combinations embark on Cabral’s course, and the win went to Tracy Magness and Mr. and Mrs. John Bartko’s Tarco Van Ter Moude. It was their second win of the season in this popular 1.40 meter class. Tracy Magness and Tarco Van Ter Moude in Wednesday's $2,500 Brook Ledge Open Welcome. 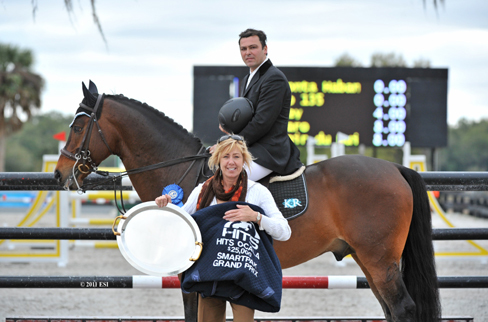 Sarah Johnstone and North Ridge’s Starlet secured second place, while Tracy Fenney and MTM Farm’s MTM Timon, last year’s winners of the $100,000 DeLuca Toyota Tundra Grand Prix, presented by Great American Insurance Group, finished in third. HITS Ocala has a strong mix of returning and new customers who all enjoy that special something about Marion County, also known as the Horse Capital of the World. HITS Ocala is lucky to have such a large, welcoming local community that embraces and enthusiastically supports the exhibitors at HITS Post Time Farm. The Ocala Winter Classic continues this week and will be highlighted by the $50,000 EMO Grand Prix, presented by Pfizer Animal Health, and the $5,000 Devoucoux Hunter Prix on Sunday, February 13. All Grand Prix and Devoucoux Hunter Prix events this season are qualifiers for the 2011 Pfizer $1 Million Grand Prix and inaugural Diamond Mills $500,000 3’3” Hunter Prix Final, which will take place September 10-11 at HITS-on-the-Hudson in Saugerties, New York. The Sanctuary, HITS Ocala Winter Circuit's Official Equine Sports Therapy Center, is proud to host a special event for all HITS exhibitors on Monday, February 14 from 10 to 4 pm. “For the Love of Your Horse” will be an all day affair featuring demonstrations, vendors, food and more! This off-site event is an ideal opportunity for horse lovers of all ages to meet The Sanctuary’s top-notch team of equine health professionals and some special guests, who will be on hand to share their insights into the many advanced technologies available for equine therapy and conditioning. 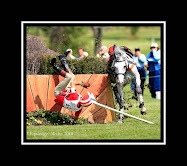 In the afternoon, guests can enjoy an interactive panel discussion on lameness, rehabilitation, and equine podiatry, as well as a live double lunging demonstration from the world renowned Chester Weber, and a special autograph session with legendary jockey Jean Cruguet, who made Seattle Slew famous. Located right down the road from HITS Post Time Farm at 5590 NW Highway 225, The Sanctuary is the perfect place to be this Valentines Day, for the love of your horse! Founded in 1999, SmartPak Equine is the country's largest online and catalog retailer serving the needs of the active and engaged horse owner. The patented SmartPak® supplement feeding system has simplified the process of feeding horse supplements and medications, making it easier for thousands of riders to keep their horses healthier by ensuring their supplements are being fed correctly. SmartPak's diverse and expansive product offering includes its own line of supplements, tack, and horse blankets as well as an extensive selection of leading brands of equine health, apparel, tack, and equipment. 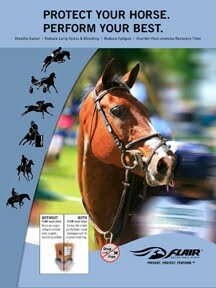 SmartPak is a six-time Inc. 500/5000 honoree and is the only equine company ever named to the Inc 500 list. SmartPak is backed by Waltham, MA-based North Bridge Growth Equity.